Abies magnifica var. critchfieldii was first described in 2010 by Ronald M. Lanner. It is named for William B. Critchfield (1923-1989) "in recognition of his distinguished contribution to the genetics, systematics, biogeography and evolution of western North American conifers" (Lanner 2010). He is now most often remembered for his book, The Distribution of Forest Trees in California and his splendid atlas, Geographic Distribution of the Pines of the World. Description. This variety differs from the typical species through differences in the seed cones. The seed cones on A. magnifica var. magnifica measure 5.6 to 9.2 inches (14 – 23 cm) long, while the seed cones of var. critchfieldii are shorter, 3.6 to 6.8 (9 - 17 cm) long, colored purple when young, maturing to brown. Distribution. 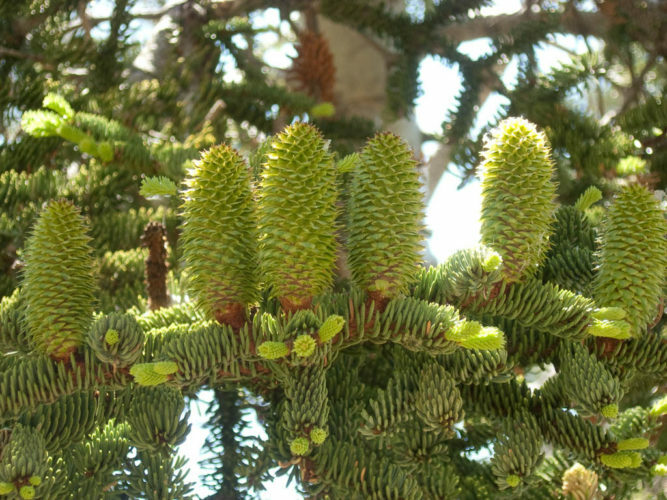 This specific variety is native to the southernmost range of Abies magnifica, south of the Kings River in California. The nature of the boundary between the varieties (whether sharp or gradational) has not yet been studied. Attribution from: R.M. Lanner; ©2010. Abies magnifica var. critchfieldii, a new California red fir variety from the Sierra Nevada. Abies magnifica var. critchfieldii — developing cones and shoots along Alta Peak trail, Sequoia National Park, California.